We left our lodging in Cortez, Colorado the morning of October 4th for the short trip to Mesa Verde National Park and then on to Salida, Colorado by way of Wolf Creek Pass. As anticipated, we only got a few hundred yards into Mesa Verde National Park before we were met with road closure signage and a pleasant but unmovable young National Park ranger. Not expecting to receive any special treatment, I none the less, approached him to explain the purpose of our visit and desire to at least drive to the top of the mesa. Of course, he had strict orders to thwart any attempt to enter the Park– no exceptions. Fortunately, we had visited Mesa Verde National Park and the surrounding region with our younger daughter Jeanette and our then 9 year old grandson Tommy 14 months ago. We had a great time climbing ladders into several of the cliff dwellings inhabited by the Anasazi Indians 600 to 1,300 years ago. Jean and I were too young to travel when they lived there. Obediently, we took a photo to document our presence at the Park and moved on along AZ-160 toward our next evenings stop, Salida, Colorado on the far side of the San Juan and Sangre de Christo mountain ranges. Traveling east from the Grand Canyon to as far as Pagosa Springs, Colorado one has a fairly level ride through picturesque canyons and rolling (by comparison) plains. However, soon after Pagosa Springs (named for the warm mineral springs that emanate from the ground in the downtown area), one is faced with the challenge of traversing the San Juan Mountains. The most convenient route is to follow AZ-160 over the mountains through Wolf Creek Pass at an elevation of more than 10,500 feet above sea level. This effort of this accomplishment is somewhat mitigated by the fact that one begins the serious ascent from the altitude of more than 5,000 feet. Never the less, the final 5,000 foot climb is achieved in something on the order of 10 miles of steeply ascending road. We (actually I) were not too intimidated by this challenge, having accomplished roughly the same feat at the beginning of our Park-to-Park loop when we ascended to the Visitors Center in Rocky Mountain National Park. As we were to learn on a later date, the Jeep (Jenny) thought otherwise. 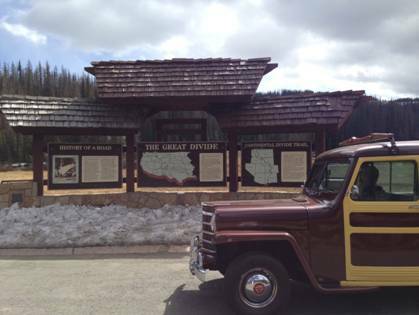 Apparently, the experience of having overheated on a couple of recent occasions due to a faulty engine thermostat, combined with the 30 minute 2nd gear climb to the top of Wolf Creek Pass was a little more than Jenny’s engine could take. Cresting Wolf Creek Pass and the Continental Divide at 10,850 feet above sea level. Notice the snow! 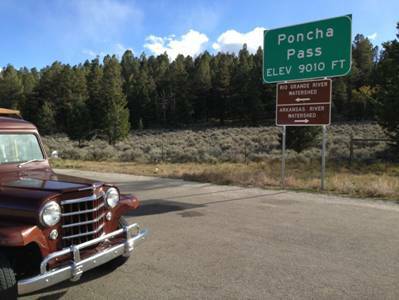 After an additional three hours of driving, some of which was along the 35 mile long gun barrel straight stretch appropriately named The Gunbarrel Road, we successfully traversed Poncha Pass through the Sangre de Christo Mountains and continued down into Salida, Colorado for the evening. 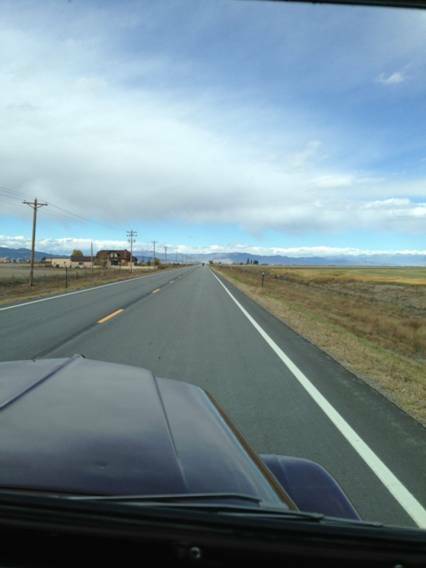 Gunbarrel Road – 35 miles of straight road through the San Luis Valley, Colorado toward the Sangre de Christo Mountains and 9,010 foot Poncha Pass. Thank you so much for the words of encouragement throughout the Trek. Jenny did indeed blow a head gasket. But not before completing the entire loop of the 12 Parks and back to Denver. Probably started with the violent backfire on the trip out and made worse by two overheating episodes. It was as if she kept it from us until loop was completed and then gave in from the effort. Anyway, some super professionals got her fully squared away in Denver last week. We are now a couple of days from home – quite the adventure.